The Making of an Avant-garde: IAUS 1967-1984, had a private screening at the Museum of Modern Art in fall 2012. Diana Agrest has received grants from the Graham Foundation, NYSCA, and the Brunner Grant among others for the film project, which she has written, directed and produced. 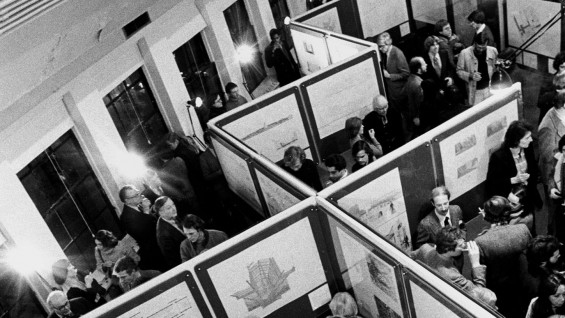 "The Institute for Architecture and Urban Studies (IAUS), founded in 1967, was an independent, non-profit organization that became an important center of architectural debate. The critical undertakings by members of the IAUS made it the center of new architectural ideas produced through research, public lectures, publications (such asOppositions, Books, and Skyline), exhibitions, and education programs. The IAUS reversed architectural dependency on Europe, becoming "the" international destination for architecture, and making New York architecture's global center. Participants at the IAUS included Peter Eisenman, founder and director; Emilio Ambasz; Mario Gandelsonas; Kenneth Frampton; Anthony Vidler; Rosalind Krauss; Philip Johnson; Richard Meier; Charles Gwathmey; Frank Gehry; Rem Koolhaas; and Aldo Rossi. The IAUS has had an enormous influence and legacy, both in terms of the great amount of work it produced, and through the dissemination of ideas that its fellows worked on and taught. Agrest's documentary film brings new insight into this important institution."